What is NAAIP and What Do They Offer? Many agents are guilty of trying to generate leads solely by buying from third parties. There must be a better way and NAAIP is here to guide you. A free agent website with embedded life and med-sup quote engines is a great tool to cause the visitor to input his/her name, phone and email. These tools are free forever for any insurance agent with no cost of obligation whatsoever. Agents are encouraged to customize their website to their business. To put their NAAIP website on their own domain and do the steps to move their website up Google. In essense, NAAIP is givng away needed tools to help insurance agents earn more money. NAAIP offers insurance agents a variety of additional services that you may avail at your discretion. There is no obligation to do so whatsoever. Increasing popular as the population is aging. Well known carriers such as Mutual of Omaha, TransAmerica, United Home Life, Oxford, Assurity, and others all pay very high first year compensation to you. Certain carriers allow over-the-phone sales. Payments direct from the carrier. Residual commissions will follow at a lower level. Lots of agents are selling similar policies for dozens of points lower in commision. Join the 125 Club. The 125% Club is a very strong hint as to the compensation that you will receive. Many carriers are mightily upset at us for publishing these super-high compensation levels online. Every 5 Medicare Advantage sales will earn you 1,000 free mailers. Every 10 Medicare supplement gets you 1,000 free mailers. Highest CMS allowed compensation on all Med advantage and highest carrier allowed street level on supplements. Access our 100% accurate med sup, med advantage and part D quoters by asking us for the password. It is that simple. At last count we offer 23 Medicare supplement and 12 Medicare Advantage carriers. MYGA, fixed, indexed, variable, etc. An annuity is really a simple product. CDs vs. Annuities. An annuity offers a higher return, more liquidity and tax benefits. At last count, NAAIP offers 19 different annuity carriers. It can be confusing, because of the immense choices. 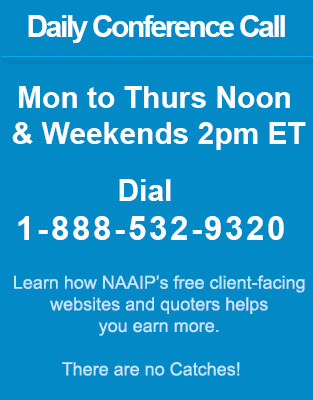 NAAIP cuts through the fog and will direct you to offer the annuity that is best for your client. Our brokerage has attracted many of the top producers in the USA because we offer higher commissions. Brilliant idea. NAAIP offers agents the latest technology such as IGO eApps and Quick tickets. We broker for dozens of carriers. JH, Banner, Protective, UOO, Pacific, LBL, AIG, NA, ANICO, AXA, Trans, PRUCO, SBLI, Foresters and others. Virtually the entire term life industry is at your disposal. Underwriters and case managers are here to help you. Term life insurance is simple and we understand that having a reputation of offering exceptionally high compensation is a good thing. This high compensation allows us to attract the top producers in the industry. These bigger ticket products demand a bit more service. Need an illustration or to talk to an underwriter? We are here to serve. The term carriers listed above also offer these products. Additional carriers such as Allianz, AXA, NY, Minnesota and Met Life often times are used in bigger cases. LTCi is huge money. NAAIP's expertise is presenting you the right product for your client. This industry has emerged over the years to allow the client to "fork over" a large percentage of his/her wealth to the local insurance agent. Let us help you capture this money. MOO, TransAmerica, Guardian & MedAmerica with true LTCi. JH, Nationwide, MN Life, Protective with LTC Riders. ANICO, Columbus Life, Ameritas, and many other carriers with Living Benefits. One America, LFG Money Guard, Nationwide Care Matters, Pacific Life Premier Care and other LTC Hybrid products. Let us know how we can help you. People go to work and sometimes people get sick and disabled. Insurers such as Assurity, Principal, Guardian, Mass Mutual and others specialize in this market. Once again, NAAIP wants to attract the top producers in the industry. Highest compensation to you direct from the carrier. A full portfolio demands that you have at your disposal these little policies. NAAIP works with dozens of carriers that offer these needed policies. Again, we attract the best agents in America by offering highest compensation. You get paid direct from the carrier.